I’ve got two free printable Father’s Day cards for you here from my friends at Broadman & Holman. The one pictured above is adorable. I love how it caters to younger children by offering them a sentence to finish. “I love my dad because…” You’ll be surprised at what comes out of their mouths! This way, you can fill in the card for children who are too young to write, and kids who are a little bit older can write it themselves. You know, this really isn’t the easiest phrase to complete for some kids. Some children might answer by simply saying emphatically, “I don’t know why! I just do!” And that’s okay. They just love Daddy because he is their daddy. 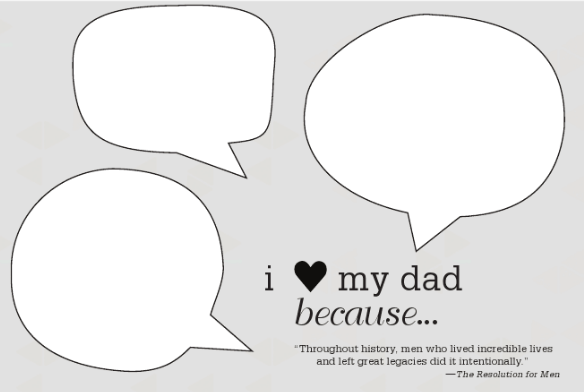 :: Download this “I love my dad because” free printable Father’s Day card HERE. The card above is created with older children in mind. This design lends itself to a couple of different Father’s Day card ideas. By cutting a straight line above and below the “Me & Dad” banner, a photo can be slipped in. Kids could also paste a photo on the card, or simply draw a picture of something they like doing with Dad. Once the outside is decorated, use the inside to write a note to Dad that tells him how much he is loved and appreciated. 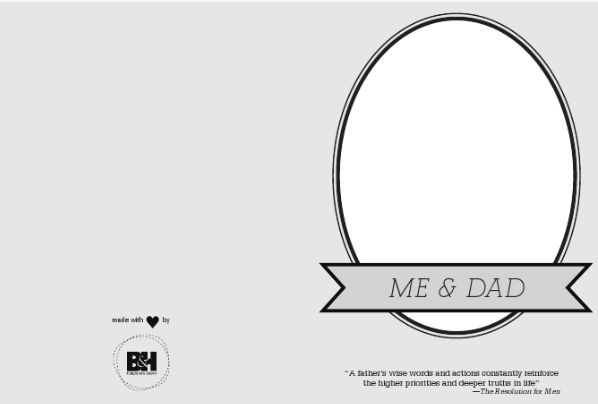 :: Download the “Dad and Me” free printable Father’s Day card HERE. Both cards include quotes from B&H’s new book release, The Resolution for Men (from the movie Courageous) which would make a great gift for Dad. The “My Daddy…” printable is another one of some really cute Father’s Day cards for kids to make HERE. 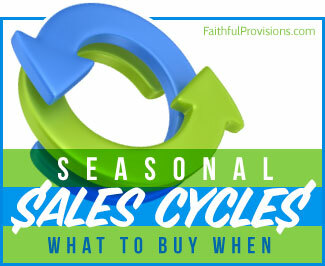 Find more printable Father’s Day cards and eCards on Faithful Provisions.